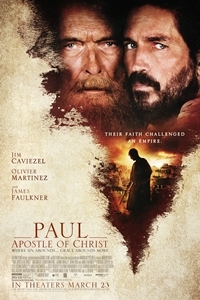 In PAUL, THE APOSTLE OF CHRIST, Paul suffers alone in a Roman prison, awaiting his execution under Emperor Nero. Mauritius, the ambitious prison prefect, can hardly see what threat this broken man poses. Amid Nero's inhuman persecution, these men and women will spread the Gospel of Jesus Christ and change the world.